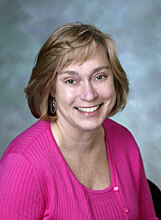 Home / Arthritis Center / Faculty / Susan Bartlett, Ph.D.
Editor: Clinical Care in the Rheumatic Diseases. 3rd edition. American College of Rheumatology. 2004. Lawren Daltroy Fellowship in Patient-Clinician Communication. American College of Rheumatology. 2001. American Thoracic Society. Behavioral Sciences Research Citation Award. 1994. Society of Behavioral Medicine, 15th Annual Scientific Sessions, April 13-16, Boston, MA. Research Citation Award.